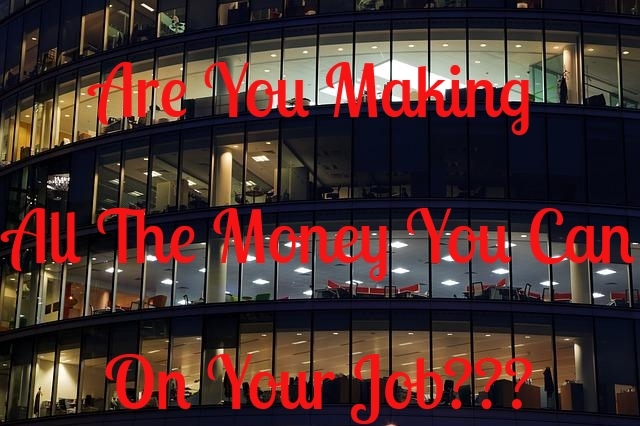 Are You Making All The Money You Can On Your Job? These days, promotions are almost impossibly to get, and the standard raise is something on the order of 2%. That makes it very difficult to increase your salary on your job. But even if you can’t, many companies offer various plans to provide additional compensation. Do you know what those are at your company, and are you taking advantage of them if you do? Many employees are given to a day-in, day-out routine, and find it difficult to rise above the typical performance to achieve greater results. But if your employer is offering you a bonus to do so, this is something you should seriously look into. On many jobs, performance bonuses are a regular and substantial portion of the employees overall compensation. But it does require that you adopt a more competitive nature, and try to go above and beyond typical production in your department. Find out if there is a performance bonus plan available where you work, and if so, what the parameters are. Realistically assess your ability to achieve the desired results, and any necessary changes in your performance that will be necessary. And if you think that you can make it happen, go for it and don’t look back. There’s a bonus on a performance bonus: the employees who regularly qualify for performance bonuses are also often the people who are most frequently promoted. Some employers are actively searching for new ideas on how to run and improve the business. Some even solicit ideas from employees – and why not, company staff are in a better position to know what will work in what won’t than anyone else. If your company has a suggestion box, make it a point to submit ideas on a regular basis. Many employers offer a bonus of some sort for ideas that are accepted. And once again, if you are a consistent source of new and workable ideas, it could improve your chances of an eventual promotion. Many companies strongly prefer hiring employees who come in with a solid referral from someone who already works at the company. The bonuses on the successful hire of a new employee can be substantial, often well in excess of $1,000. If your company has an employee referral bonus program in place, plan to take full advantage of it. Familiarize yourself with what positions they’re looking to fill, and then do some scouting and networking to determine who you know who could be a good fit for the jobs. By doing this on a regular basis, you can add thousands of dollars to your income each year. That’s a lot of additional money to make just from doing some research and making a telephone call or two. You may not think of this as a form of extra income, but that’s exactly what it is. If your employer is willing to at least partially pay for additional education, use it for all it’s worth. Though it may not represent an immediate form of compensation in your next paycheck, it can help you acquire the skills that you need in order to advance in your job. And ironically, even if you can’t rise up in your current employer, you may be setting the stage for a better position with another company further down the road, based on your improved skills and education. Many companies offer a customer referral program, even if it isn’t widely known. That’s a program in which you are compensated for providing new business to the company. If your employer has such a program, you should be taking full advantage of it. Most of the bonus programs we’ve discussed up to this point are the type that apply mainly to large employers. But a customer referral program is something that even very small employers can and will offer. All businesses, after all, have a vested interest in encouraging new business, and a customer referral plan can be implemented even if it doesn’t already exist. There is a saying, raises become effective when you do. Though your company may be stingy when it comes to giving financial raises, you can make it happen by becoming more effective in your work, and qualifying for the various bonus programs that your employer may offer. Do you ever take advantage of these programs at work?